Through the fast-falling snow, we followed the fresh tracks to the edge of a steep ravine. Several mule deer rose from the bottom and pogoed up the far side. One looked like a giant, so I jumped off my horse, grabbed my rifle from the scabbard, and sat down in a wet drift. The bullet caught the buck just as he reached the crest, and he nosed into the soft snow. He wasn't a giant, but he was a nice, clean four-by-four, with eyeguards. On that snowy morning in Montana 45 years ago, he was a giant to me. Since then I've taken quite a few mule deer, some bigger and some not so big. I'm convinced a really big mule deer is one of the most difficult prizes in North America. But things are not as bleak as you might have heard. Arizona biologist Jim Hefelfinger chairs the Mule Deer Working Group of the Western Association of Fish and Wildlife Agencies (WAFWA). "I get a call about once a month from a journalist wanting to do a story on 'the decline of the mule deer,'" he said. "I tell them they're about ten years too late!" Herds go up and herds go down, but a lot of mule deer herds in the West are increasing, and many are within science-based management goals. The West today has changed, with more development, both mineral and recreational; more urban sprawl; and more intrusion into critical winter ranges. There is not as much room for mule deer, and a lot more hunters are competing for the resource. However, a whole bunch of muleys are still out there. Total numbers are elusive but estimates say at least 3.5 million mule deer roam the American and Canadian West, plus a substantial population in northern Mexico. The five most populous mule deer states, by WAFWA 2016 estimates, are Colorado (436,000), Wyoming (364,000), Utah (348,650), Idaho (298,390), and Montana (297,231). In sheer numbers, California may have the largest herd of all — currently estimated between 450,000 and 550,000 — but the majority of California's deer are smaller subspecies, with the Rocky Mountain mule deer occupying only the northeast corner. Despite what we've been hearing for decades, mule deer are not in short supply. But then, we're not hunting just any mule deer. We're looking for a big buck. So let's try to define him. If you're like I was on that snowy Montana morning so long ago, I defined a big buck as being a typical four-by-four, with eyeguards. This is a normal configuration for a buck starting to mature. With decent diet and genetics, a four-by-four could be three years old, and if he survives, his antlers will probably grow in mass and length, but relatively few increase their tines. There are not enough four-by-fours for every hunter to find one every season, but they exist and are available everywhere muleys are found. The ultimate yardstick is the Boone and Crockett record-keeping system. B&C measures mule deer by the sum, in inches and fractions, of beam length, point length, and four circumferences on each antler, plus inside spread. For the actual record book score, differences from one antler to the other are also deducted. For inclusion into B&C's all-time Records of North American Big Game, the minimums are 190 inches for typical bucks and 230 inches for non-typicals. These are lofty minimums; few hunters will see such mule deer in their lifetimes, and fewer still will take them. B&C also has a three-year award period with an associated book, and the minimums are lower: 180 inches typical, 215 inches non-typical. True non-typicals are rare, and I've never seen one that would approach 215 inches, but I've taken several typical bucks that exceed 180 inches. That is a much more attainable goal. Hunters also often talk about outside spread, with a 30-inch buck being the Holy Grail. This is fine, too, but beam and tine length and mass are generally more important than spread. A mule deer buck that approaches 180 points will probably be fairly mature, with long beams, good points, and likely decent mass. For all but the most selective die-hard hunters, a mule deer buck in the 170s is a big buck and an attainable goal. If you are one of those die-hard "B&C or bust" hunters, such bucks are out there, but be prepared to spend lots of time looking. The Boone and Crockett Club is a dedicated conservation organization with record keeping just one of its many functions. Their credo is that their record book honors the animal as much as the hunter, and in these days when trophy hunting is under fire, they believe their records provide valuable historical data and population trends. If you're looking for big mule deer, a sound tactic is to hunt where the big bucks are. Since 2000 the top six states and provinces in producing mule deer that were entered into B&C's records are Colorado (397), Saskatchewan (157), Wyoming (110), Utah (97), Idaho (89), and New Mexico (86). These numbers comprise both typical and non-typical entries. So Colorado has the most mule deer and, by far, has produced the most record bucks in recent years. Colorado has also produced half the Top Ten typical mule deer but, interestingly, none of the Top Ten non-typicals. That doesn't mean the gene pool is lacking. In 2014, Brett Ross, hunting on public land, took a non-typical officially scored at 292-7/8, now No. 34 in the all-time rankings. Saskatchewan has long produced big mule deer. Although it's second as a recent record-producer, the population is small, an estimated 30,000 to 60,000. That's great for Saskatchewan hunters, but it doesn't do most of us much good because the province's mule deer are for residents only. The other four top producers are traditional mule deer states, but New Mexico is also interesting: 86 recent records, but its population is currently estimated at 80,000 to 100,000, much less than half the size of the herds of Idaho, Utah, and Wyoming. In New Mexico it's pretty easy to fine-tune the results because most of those record bucks came from northern New Mexico, where the deer are Rocky Mountain mule deer; the southern part of the state has desert mule deer, which are usually smaller. The thing about looking for a big buck is that you only need one, so while statistics and numbers are good, genetics and low hunting pressure are probably more important. Oklahoma has just 1,500 to 2,000 mule deer in three westernmost counties. The harvest in 2015 was 185 mule deer, but in the 2014 — 2015 season, Oklahoma recorded a new state record typical muley scoring 191-7/8 . Like I said, you just need one. Just to the north, western Kansas is a sleeper hotspot, with a surprising population of 51,000 and some giant mule deer. My personal answer for a big mule deer was Alberta, not high on any statistics except for this one: Only 1,500 nonresident permits are allocated to outfitters. Alberta has done a very good job in recovering deer numbers, especially on the southern prairies, and the genetics are extremely good. It took me three years to do it. On the first hunt a major blizzard darn near wiped us out. The second hunt was plagued by gale-force winds, although I took a nice old buck on the last day. But the third time was the charm. The weather was perfect, the deer were getting into the rut, and I took the best mule deer of my life. by-four that scored well. However, the typical muy grande from Mexico will be extremely wide but is often missing a point here or there. A nice desert mule deer from far West Texas. This area rarely produces giants, but there are a lot of mule deer and a high buck to doe ratio. It's a great place to find good-looking bucks like this one. Far West Texas is an underrated mule deer destination. At a quarter-million the mule deer population is not small. These are also desert mule deer, and relatively few bucks grow extremely large. On the other hand, some of the Texas ranchers are getting as good at managing mule deer as they have been for whitetails. Buck to doe ratios are high, and antler size is increasing. This is probably not an area for a monster mule deer, but it's a real sleeper for nice bucks. So you want a big mule deer. How much time are you willing to spend? How much money are you willing to spend? You need to do your research, but there are millions of acres of public land throughout the West. The best areas for big bucks are known (and not hard to ferret out) and will usually be by limited draw. It may take several years to score a good tag, but it's worth it. Plateau area. Likewise, in some of Colorado's better-known units, such as the Purgatory, or Arizona's Kaibab or Arizona Strip. Nevada is another sleeper. Nevada tags are difficult to draw; the herd is just 94,000 (about the same size as Arizona's), and the Department of Wildlife manages the whole state for quality. In 2015, 20,000 Nevada deer hunters enjoyed 47 percent overall success. But here's a more striking statistic: The buck harvest was 7,500, and 38 percent of those bucks had four points or more on one side. but today there are several application services, including Worldwide Trophy Adventures (formerly Cabela's T.A.G.S.). The other approach is to spend money. 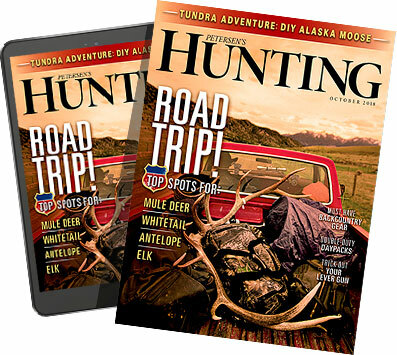 This is obvious if you're going the outfitted hunt route, and in some areas, such as Alberta and Sonora, it's the only option. This is generally also true in Texas, unless you know a landowner. Indian Reservations in the West and Southwest. The trophies can be outstanding, but prices have skyrocketed for special places that offer special opportunity. The secret to drawing tags is to be persistent and consistent — which is why I recommend tag-application services. You might beat the odds, but in great areas you'll probably need to apply for several years and build up some preference points. Be patient and stay flexible: be ready to drop everything and go when you draw the tag you've been waiting for. Patience applies in spades if, with tag in hand, you plan a DIY hunt. Obviously, you'll do as much homework and research as you can and, hopefully, some pre-season scouting. Mule deer hunting is highly weather-dependent in most places, so allocate as much time as you possibly can. If it's a short season, use it all. If it's a long season, use it all if you can, but if you can't, do your research and try to pinpoint the best time. Then allocate as much time as possible within that window. hunt or a great tag, you'll need to apply patience there as well. You may not see the buck you're looking for, but wait for him. You won't get your money's worth if you settle for less, and the last day is as good as the first. Don't be unreasonable in your expectations and follow your guide's suggestion. If you've done your homework well, the buck you're looking for is there somewhere. There's a fourth way patience applies, and this is universal. Hunt hard, hunt long, and do a lot more hunting with your optics than you do with your legs. The secret to taking a big mule deer is to find him. Use vantage points and take the country apart piece by piece. Glass up your buck — and then go get him.